from profession to profession. 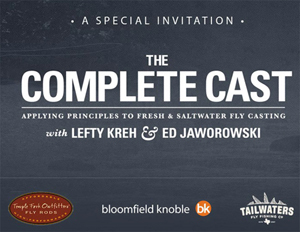 I hadn’t thought about it a lot until going to the Lefty Kreh – Ed Jaworowski event at Tailwaters on Saturday. Not only did it dawn on me how many friends I have in the fly fishing world, it also dawned on me how few friends I have, or had, in the photography world. The difference is startling in sheer numbers, and sobering in how much real interest, care and concern was directed at me from my fellow anglers and the fly fishing professional clan this past Saturday. Thank you for that. Lefty was once again in his element, having to be dragged inside, away from casting demonstration and helping the ladies, to spend hours signing autographs (hundreds) and talking to each person as if they were his next door neighbors. How stark is that difference from other modern athletes in other sports? And that was one of the first things that helped cast the spell of fly fishing over me; access to the legends, the elite, is easy and laid back. It’s a far cry from, as I said (and have experienced) other pro athletes, heady musicians and insecure artists. I guess many of you would say that it’s still such a small sport. It seemed pretty darn big on Saturday though. As I had written recently, the DVD “The Complete Cast” is really the coda for the major contribution Lefty Kreh has made to fly casting with his “Kreh Cast” as I’ve labeled it. At $50-dollars a pop, I saw dozens and dozens of the DVD’s being autographed (for giddy fly fishers) by Lefty and Ed, as well as books and TFO hats. Tailwaters and the folks at TFO were well prepared for the event, and took great care of the 91-year-old legend. Let us all wish Lefty a Happy Birthday on February 26th.! I am in the process of trying to secure a supply of the DVDs to be for sale on the PoPs Fly Shop website, so stay tuned for that announcement! Tailwaters before their opening. Video of the Lefty & Ed tour coming soon. Stay tuned! And Tailwaters is absolutely in top form with all hands on deck, answering questions, promoting local guides like myself, and on top of a fantastic breadth of merchandise unmatched by any fly shop in Texas. That includes some pretty far out offerings, like the Tailwaters Hatch Reel created specifically for Tailwaters – yes $1200-dollars each, and a limited run of 20 (I believe four were sold). 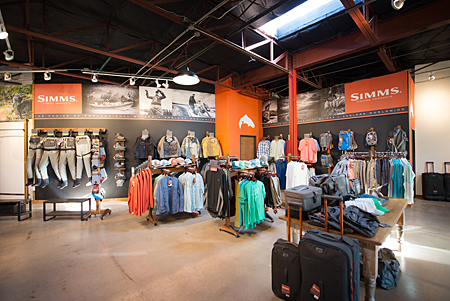 The new Tailwaters is definitely a place you’ll feel comfortable “hanging out” at, and whether you’re back at the bar, or over checking out the fly fishing trips, or on the back deck kicking back, or walking the spacious retail floors, or at the levy casting a new rod, if fly is your thing – time will FLY by while you’re there. It may sound like I’m raving about it, so I’ll leave it up to you to prove me wrong. If there’s a better executed fly shop in Texas, let me know. And don’t waste your breath about them not carrying fly tying materials! That’s just good business sense, especially when you can order materials from online stores, or in person at Dallas’ Barlow’s Tackle on Central Expressway. The big story this week is this strange weather in North Texas. Apparently, we’re going to top out near 85-degrees by Friday with several days in the 70’s leading up to Friday. Strange days indeed. This brief window looking out to spring is the perfect opportunity to make haste on the Airstream front (read about that project at www.airstreamdiary.com), where we are getting visibly closer to the finish line after each 2016 workday ends. Unfortunately, my original plan of spending extended time at Beaver’s Bend guiding, and living in the Airstream, has been put on indefinite hold since the floods and damage there last year. However, I did hear that Beaver’s Bend reopened last week. Of course the Airstream project will take precedent with this great weather. A close finisher, if not tie, goes to fly fishing — also to be blamed on the great weather, but if we can get some predictable cold and cloudy weather? It’ll be time to do some serious fly fishing in Oklahoma, or more likely head to Danigerfield for chain pickerel on fly. All we need is a little weather predictability. As always, I hope you all arrive safely to your respective destinations and hug the ones you love every day. Have a fantastic week at work (and appreciate the fact you are working and being paid), and check back here often for new stories, news and everything else that fits. Three Rivers Fly Shop across from Beaver’s Bend is closing, or already closed.